Win a $5,000 Shopping Spree or 1 of 10 $100 Gift Cards! NOTE: You'll need to submit a short video to be eligible to win this contest, but that means the odds of winning are much better since there will be far fewer entries! Everyone knows kids that have been good all year reap the most rewards during the holidays. 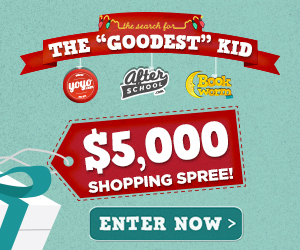 YoYo.com (toys), AfterSchool.com (sports and activities), and Bookworm.com (books) – a new family of kids sites from the folks at Diapers.com – are taking goodness to an extreme this holiday season with the Search for the “Goodest” Kid contest. The grand-prize winner will receive a $5,000 Ultimate Holiday Shopping spree across the sites to buy tons of toys, sports gear and books and ten runners up will win a 100 gift card to shop the sites!